In the golden 1900s, Harry Cane, a shy, eligible gentleman of leisure is drawn from a life of quiet routine into courting and marrying Winnie, eldest daughter of the fatherless Wells clan, who are not quite as respectable as they would appear. They settle by the sea and have a daughter and conventional marriage does not seem such a tumultuous change after all. When a chance encounter awakens scandalous desires never acknowledged until now, however, Harry is forced to forsake the land and people he loves for a harsh new life as a homesteader on the newly colonized Canadian prairies. There, in a place called Winter, he will come to find a deep love within an alternative family, a love imperiled by war, madness and an evil man of undeniable magnetism. A Place Called Winter is a tale of heartbreaking hardship, a book that seems to combine Pride and Prejudice with E.M Forsters’ Maurice. Winter, Saskatchewan, Canada is in fact a real place, which was first settled in 1908. 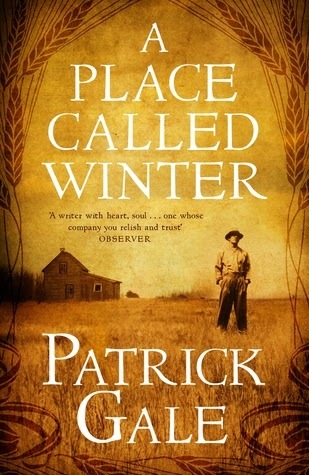 Among these settlers was Patrick Gale’s fictional figure Harry Cane, whose experience is loosely based on Gale’s own great grandfather who was mysteriously banished from the country leaving his wife and young child back in England while he faced the wilderness of Canada alone. Nothing could seem more unrealistic, at first than a married man living in England with a young child and private income who should decide to leave it all and sail for a life full of hardship and uncertainty in Canada. However by the time Harry Cane gets on the immigrant ship, Gale has established his character with precise economical strokes. Harry is apt to stammer and is constrained by everything that is expected of him. What changes his life utterly is the realization that he loves men, in a period where homosexual acts, even in private, were punished by law and social disgrace. Harry meets Mr. Browning and they begin a sexual relationship, which on Harry’s side is a relation of love and passion. Yet when a blackmailer exposes their relationship, Harry is told by his wife’s family to remove himself from his wife, child and country. A Place Called Winter does not resolve itself, or offer a closed ending, but it does offer hope that emotional truth and loyalty to that truth maybe a way forward for Harry. He is an intensely sympathetic character in his struggles. Harry Cane’s tale is one of many, the disappeared who where not wanted by their family or society, and whose stories were long stained with shame. This fascinating novel is their requiem.